NYS Gov. Andrew M. Cuomo and Lt. Gov. Kathy Hochul launched the 100th anniversary of women voting in the state by announcing the Women’s Suffrage Commission’s website: www.ny.gov/suffrage. It provides information about upcoming events across the state, profiles New York suffragists, and draws attention to historic destinations relevant to the suffrage movement and women’s rights. New York was home to the first-ever Women’s Rights Convention, held in Seneca Falls, on July 19 and 20, 1848 and organized by Lucretia Mott and Elizabeth Cady Stanton. Sixty-nine years later, on Nov. 6, 1917, women in New York State won the right to vote. The 14-member NYS Women’s Suffrage Commission chaired by Kathy Hochul, will plan and execute a series of statewide programs starting in 2017 and lasting through 2020. As part of New York’s recognition of Women’s History Month, a number of exhibits will be available for public viewing in both the Empire State Plaza and the New York State Capitol Building. The exhibit “Women’s Suffrage in New York State,” located in the Capitol corridor which connects the state house to the Empire State Plaza, includes imagery of pro- and anti-suffrage propaganda with historic photographs of the women who organized and marched until the vote was won. The exhibit, “New York State Women’s Suffrage 1917 – 2017 | The Fight for the Vote and the March for Full Equality,” is located in the East Gallery on the second floor of the Capitol and traces the almost 70-year struggle for the vote. The exhibit highlights the lives of 12 influential Suffragists and the critical role they played in securing the vote by African Americans and working women. This month-long exhibit features the “Spirit of 1776” wooden suffrage wagon in which a Long Island suffragist edna Kearns and her eight-year-old daughter traveled throughout Long Island and Manhattan during the summer of 1913 to gather support for votes for women, a 1917 banner carried by suffragists, as well as Elizabeth Cady Stanton’s 1854 address to the New York State Legislature. One of the highlights of the New York State Capitol is the Great Western Staircase featuring a gallery of historic Americans brought to life in elaborate stone carvings. As the staircase was nearing completion, it was observed that not one famous woman was represented. Located in the area just outside the Empire State Plaza Visitor Center and Gift Shop this exhibit will feature photographs of the six carvings of women that were added to the staircase: Harriet Beecher Stowe, Clara Barton, Frances E. Willard, Molly Pitcher, Elmina Spencer, and Susan B. Anthony. Also on view outside the Visitor Center is the mural Harriet Tubman and the Underground Railroad created by students from the Monroe Community College Art Department in Rochester, NY. Throughout March, special one-hour Capitol tours focusing on the suffrage movement are available to visitors. The tours feature artifacts selected to showcase the suffragists’ journey. For more information about the Capitol tours, visit www.empirestateplaza.org. 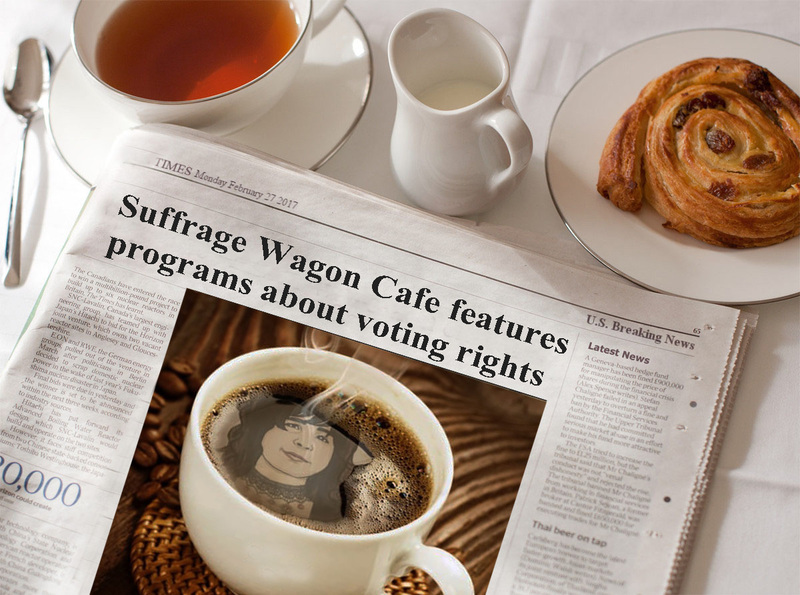 Program at Suffrage Wagon Cafe coming soon!